Injury to the posterior cruciate ligament (PCL) can range from a stretch to a total tear or rupture of the ligament. These injuries are less common than anterior cruciate ligament (ACL) injuries as the PCL is broader and stronger. The PCL is one of the two cruciate ligaments of the knee. It acts as the major stabilizing ligament of the knee. and prevents the tibia from excessive posterior displacement in relation to the femur. It also functions to prevent hyper-extension and limits internal rotation, adduction and abduction at the knee joint. The PCL is twice as thick as the ACL which results in less injuries than the ACL due to the stronger nature. As a result, PCL injuries are less common than ACL injuries. It originates at the internal surface of the medial femoral condyle and inserts on the center of the posterior aspect of the tibial plateau, 1 cm below the articular surface of the tibia. It crosses the ACL to form an 'X'. The PCL consists of two inseparable bundles: the wide anterolateral (AL) bundle and the smaller posteromedial (PM) bundle. The AL bundle is most tight in mid-flexion and internal rotation of the knee, while the PM bundle is most tight in extension and deep flexion of the knee. The orientation of the fibers varies between bundles. The AL bundle is more horizontally orientated in extension and becomes more vertical as the knee is flexed beyond 30°. The PM bundle is vertically orientated in knee extension and becomes more horizontal through a similar range of motion. The mean age of people with acute PCL injuries range between 20-30's. Injuries to the PCL can occur isolated, mostly as a result of sport, as well as combined (see multi-ligament knee injuries), usually caused by motor vehicle accidents. A 2% incidence is estimated for PCL injuries, and it can range from 3,5-20% for operated, isolated and combined PCL injuries. The most frequent mechanism of injury is a direct blow to the anterior aspect of the proximal tibia on a flexed knee with the ankle in plantarflexion. This often occurs as dashboard injuries (posterior force to the tibia in a flexed knee) during motor vehicle accidents and results in posterior translation of the tibia. Hyper-extension and rotational or varus/valgus stress mechanisms may also be responsible for PCL tears. These injuries occurs mostly during sports such as football, soccer and skiing. Isolated PCL injuries are commonly reported in athletes, with hyper-flexion being the most frequent mechanism of injury. Further mechanisms of PCL injury include bad landings from a jump, a simple misstep or fast direction change. PCL injuries present in different degrees according to the severity. Grade 1: Limited damage with only microscopic tears in the ligament, mostly as the result of an overstretch. It is still able to function and stabilize the knee. 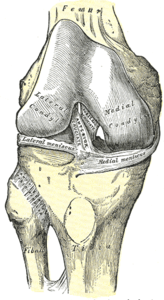 Grade 2: The ligament is partially torn. There is a feeling of instability. Grade 3: Complete ligament tear or rupture. This type of injury is mostly accompanied by a sprain of the ACL and/or collateral ligaments. A distinction can be made between the symptoms of an acute and chronic PCL injury. Symptoms are often vague and minimal, with patients often not even feeling or noticing the injury. Minimal pain, swelling, instability and full range of motion is present, as well as a near-normal gait pattern. Symptoms differ according to the extent of the knee injury. This includes swelling, pain, a feeling of instability, limited range of motion and difficulty with mobilisation. Bruising may also be present. Patients with a chronic PCL injury are not always able to recall a mechanism of injury. Common complaints are discomfort with weight-bearing in a semi flexed position (e.g. climbing stairs or squatting) and aching in the knee when walking long distances. Complaints of instability are also often present, mostly when walking on an uneven surface. Retropatellar pain and pain in the medial compartment of the knee may also be present. Potential swelling and stiffness depend on the degree of associated chondral damage. Bone scans: Best in chronic cases with recurrent pain, swelling and instability. Detect early arthritic changes before MRI or Xray. These patients have a higher risk of developing articular cartilage degenerative changes, shown by areas of increased radiotracer uptake, most commonly in the medial and patellofemoral compartments. An acute grade III injury can also be managed conservatively. Immobilization in a range of motion brace in full extension is recommended for two to four weeks, due to the high probability of injuries to other posterolateral structures. The posterior tibial sublaxation caused by the hamstring is minimized in extension, causing less force to the damaged PCL and posterolateral structures. This allows the soft tissue structures to heal. Physiotherapy is recommended as part of the conservative management. Return to play after conservative management of grade III tears is normally between 3 and 4 months. Chronic isolated grade I & II PCL injuries are usually managed conservatively with physiotherapy. Activity modification is recommended in chronic cases with recurrent pain and swelling. The primary objective during a PCL reconstruction is to restore normal knee mechanics and dynamic knee stability, thus correcting posterior tibial laxity. There are different options of the optimal surgical approach for a PCL reconstruction. Debate exists about the best graft type or source, placement of the tibia, femoral tunnels, number of graft bundles and the amount of tension on the bundles. When using a double bundle graft, both bundles of the PCL can be reconstructed. A single bundle graft reconstructs only the stronger anterolateral bundle. The double bundle approach can restore normal knee kinematics with a full range of motion, while the single bundle only restores the 0°-60° knee range. Allograft (mostly Achilles tendon): Decreased surgical time and the absence of iatrogenic trauma to the harvest site. The Achilles tendon graft produces a large amount of collagen and ensures a complete filling of the tunnels. This is normally used to reconstruct the AL bundle. The AL graft is tensioned and fixed at 90° knee flexion. Bone-patellar tendon-bone: Most common, as the bone plugs allow sufficient fixation of the tissue. The disadvantages of this graft are the harvest site morbidity and as a result of the rectangular form of the graft, the tunnels can not be completely filled with collagen. Quadrupled hamstring: Decreases the morbidity factor, but results in an inferior fixation method. A double semitendinosus tendon autograft is normally used for the PM bundle reconstruction. The PM graft is tensioned and fixed at 30° knee flexion. Quadriceps tendon: Has morbidity factor and adequate biomechanical properties. Surgical reconstruction of the PCL is recommended in acute injuries with severe posterior tibia subluxation and instability, if the posterior translation is greater than 10mm or if there are multiple ligamentous injuries. PCL avulsion fracture injuries fractures heal well when operated early on. High demand individuals, such as young athletes, are normally treated with surgery as soon as possible, to enhance the chances to return to full functional capacity. 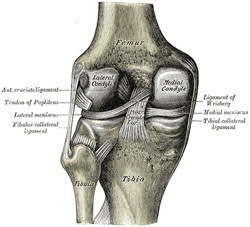 Grade III injury of the PCL are mostly combined with other injuries, and thus surgical reconstruction of the ligaments will have to be done, often within 2 weeks from the injury. This time frame gives the best anatomical ligament repair of the PCL and less capsular scarring. Tibial inlay procedure: Starts with a diagnostic arthroscopy, but the inlay itself is an open surgery. The femoral tunnels are established with an outside-in technique to closely duplicate the femoral insertion of the PCL-meniscofemoral ligament complex. The graft is prepared during the exposure. Then it is placed in the graft passer and passed through the femoral tunnel, tensioned and screwed to the bone. Limiting knee range of motion bracing is needed after the surgery (see physiotherapy management). Tibial tunnel method: Arthroscopical approach. A guide pin is drilled from a point just distal and medial to the tibial tubercle and aimed at the distal and lateral aspect of the PCL footprint. The femoral tunnel should be placed just under the subchondral bone, to reduce the risk of osteonecrosis. The direction of the graft passage depends on the type of graft used. The tibial inlay procedure avoids this difficult part. The graft is placed in 70° to 90° flexion. In the single bundle reconstruction only 1 tunnel is drilled. In a double-bundle reconstruction two tunnels are drilled, which is technically more challenging. Decrease range of motion (can be caused by improper placement or too much tension of the graft). Strengthening the quadriceps is a key factor in a successful recovery, as the quadriceps can take the place of the PCL to a certain extent to prevent the femur from moving too far forward over the tibia. Return to play is sport specific, and only after 3 months. Chronic PCL injuries can be adequately treated with physiotherapy. A range of motion brace is used, initially set to prevent the terminal 15° of extension. After a while the brace is opened to full extension. Post-operative rehabilitation typically lasts 6 to 9 months. The duration of each of the five phases and the total duration of the rehabilitation depends on the age and physical level of the patient, as well as the success of the operation. Also see page on PCL reconstruction. Normalize gait pattern, especially the loading and stance phases with quadriceps activation. Pool jogging are performed during this phase. Line hops, bounding and ladder drills. Closed chain squatting and lunging (0°-75°). Increase strengthening exercises and neuromuscular control demands. Hop test: Minimum 90% compared to the unaffected limb. Functional knee brace may be used to increase proprioception and facilitate normal knee mechanics during running and pivoting activities. PCL injuries are mostly caused by hyper-flexion and injuries do not occur frequently. This is due to the strength of the ligament and the fact that hyper-flexion, possible through a force to the anterior aspect of the proximal tibia, does not commonly occur. PCL injuries will mostly happen during sports, such as football, soccer and skiing. Another possible mechanism of injury can be a car accident, resulting in a 'dashboard injury'. The severity is divided in three degrees and an acute injury is distinguished from a chronic injury. Clinical presentation will depend on the degree and the condition of the injury. If symptoms are observable, these usually include swelling, pain, a feeling of instability, limited range of motion and difficulty with mobilisation. The treatment depends on the grade and the individual patient. A grade I and II injury are usually treated non-surgically, unless it occurs in an young athlete or high demand individual. A grade III injury is usually treated by a surgical intervention, however non-surgical treatment is also possible. Physiotherapy plays a role in conservative management, as well as post-operative rehabilitation. Both rehabilitation programs focus on the quadriceps muscle group, because of its ability to partially take over the function of the PCL. The structure and the build-up of the rehabilitation program depends on the degree of the injury, the individual patient and the success of the operation (if applicable). ↑ 1.00 1.01 1.02 1.03 1.04 1.05 1.06 1.07 1.08 1.09 1.10 1.11 1.12 1.13 1.14 1.15 1.16 1.17 1.18 1.19 1.20 1.21 1.22 1.23 Medscape. Drugs & Diseases, Sport Medicine. Posterior Cruciate Ligament Injury. https://emedicine.medscape.com/article/90514-overview (accessed 20/08/2018). ↑ 2.0 2.1 2.2 2.3 2.4 2.5 2.6 Paulsen F, Waschke J, Sobotta. Lower extremities, Knee Joint. Elsevier, 2010. p 272-276. ↑ 3.0 3.1 Schulz MS, Russe K, Weiler A, Eichhorn HJ, Strobel MJ. Epidemiology of posterior cruciate ligament injuries. Archives of orthopaedic and trauma surgery 2003;123(4):186-91. ↑ 4.00 4.01 4.02 4.03 4.04 4.05 4.06 4.07 4.08 4.09 4.10 4.11 4.12 4.13 4.14 4.15 4.16 4.17 4.18 Lee BK, Nam SW. Rupture of Posterior Cruciate Ligament: Diagnosis and Treatment Principles. Knee Surgery and Related Research 2011 Sep;23(3):135-141. ↑ 5.0 5.1 5.2 American Academy of Orthopaedic Surgeons. Diseases & Conditions: Posterior Cruciate Ligament Injuries. http://orthoi/nfo.aaos.org/topic.cfm?topic=a00420 (accessed 20/08/2018). ↑ 6.00 6.01 6.02 6.03 6.04 6.05 6.06 6.07 6.08 6.09 6.10 6.11 6.12 6.13 Fowler PJ, Messieh SS. Isolated posterior cruciate ligament injuries in athletes. The American Journal of Sports Medicine 1987;15(6):553–557. ↑ 7.0 7.1 7.2 Malone AA, Dowd GSE, Saifuddin A. Injuries of the posterior cruciate ligament and posterolateral corner of the knee. Injury 2006;37(6):485-501. ↑ 8.0 8.1 8.2 8.3 8.4 8.5 Bisson LJ, Clancy Jr WG. Chapter 90: Isolated posterior cruciate ligament injury and posterolateral laxity. In: Chapman’s Orthopaedic Surgery. 3rd edition. Philadelphia: Lippincott Williams & Wilkins 2001. ↑ 9.0 9.1 British Medical Journal Best Practice. Evaluation of knee injury. https://bestpractice.bmj.com/topics/en-us/575 (accessed: 22/08/2018). ↑ 10.00 10.01 10.02 10.03 10.04 10.05 10.06 10.07 10.08 10.09 10.10 10.11 10.12 10.13 10.14 10.15 10.16 Wind WM, Jr, Bergfeld JA, Parker RD. Evaluation and treatment of posterior cruciate ligament injuries: revisited. The American Journal of Sports Medecine 2004, 32(7):1765–1775. ↑ 11.0 11.1 11.2 Walters J, editor. Orthopaedics - A guide for practitioners. 4th Edition. Cape Town: University of Cape Town, 2010.